Few weeks ago, just as in the last few centuries, the land claims of rural workers have been brought back up in several spots of Latin America. If it is really true that our own 21st century cannot base its economies exclusively in small farms, it isn’t less true that economic disenfranchisement is still an urgent popular cause in any social or historical progress. I could very well say that that the old Latin American cause didn’t exist in the United States, the paradigm of economic development, etc. But the answer is quite easy: in the United States there were no farm movements nor “liberation movements” because this country wasn’t founded upon the estates of an aristocratic society, as in Latin America, but rather upon an initial distribution infinitely more equitable of colonists that worked for themselves and not for the King or the landholder. It’s not by chance that the founders of the original United States considered themselves successful in their anti-imperialist, populist, and radically revolutionary projects, whereas our Latin American leaders died embittered when not in exile. As the caudillos of that day used to say, “the laws are respected but not enforced.” And so we had republican and egalitarian constitutions, almost always copies of the American one but with a different twist: reality contradicted them. 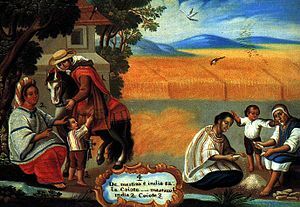 That feudal system (typical of so many Latin American countries that included pawns for free almost, or the “pongueo” system that impeded farming and industrial development) existed in the southern United States. But it was defeated by the progressivist forces of the North. Not in Latin America. This structure of our continent, vertical and aristocratic, served up its own self-exploitation and its own underdevelopment and benefited the world powers taking their turns, who were not foolish enough to sustain moralist discourses about the old aristocracy. Meanwhile, our “heroic” oligarchy squandered the demoralizing debate toward those who claimed more social and economic equity. According to this discourse accepted unanimously by the slaves themselves, those who were opposed to the landholding estate Order were idlers that wanted to live off the State, as if the oligarchy didn’t help itself to the violence of this State to sustain its privileges and interests, almost always supporting dictatorships on call that they meaningfully called “saviors” and then they “combated” in the discourse to present themselves as the eternal “saviors of the country” and to reinstall the same aristocratic status quo, the very reason for the historical setbacks of our societies. Thus, business was twofold but insatisfaction was also twofold: both those at the bottom and those at the top agreed on something: “things in this country don’t work” or “no one can save this country, etc.” But on reforms, nothing. Ron Paul et l’anarchisme de droite.